Maintenance is a very important part of your generator’s life. Having a well-maintained generator is going to help ensure that it lasts for many years to come. It’s highly recommended that you establish a maintenance schedule with us so that we can always make sure your generator is working the way it should. A generator that works correctly is one that will be efficient for years to come. To ensure your system is in working order, it’s best to set it up with an automatic exercise cycle. This is where the generator is exercised each month to ensure system readiness. The time of day can be set for the cycle to be run, which means it will automatically start and run for a predetermined amount of time. During this period, the power that is available from the generator does not go into the home and utility power is not interrupted. If you do a manual exercise operation, this can be performed at any time from the control panel behind the service access door. You can flip the switch to “RUN” and the generator will start to run. The power that is available does not go into the home and utility power is not interrupted. System testing is also very important. Power failure can be simulated to ensure that the system is running properly. The main circuit breaker can be opened ahead of the transfer panel. The system will then start going through the start sequence from standby as if the power had really gone out. These are tasks that you can perform on your own or you can always call our generator company to ask questions or have us check and maintain your system for you. When you have your generator installed, we would show you how to do these simple steps. With regularly scheduled maintenance, we do a thorough evaluation of overall operation. This means finding problems before they start, which can save a great deal of money. We ensure that every moving part is operating and sounding the way it should. If anything is not behaving correctly, then the issue will be rectified as soon as possible. 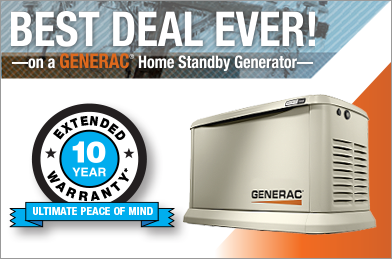 To ensure the sound operation of your generator, our generators come with a 5-year warranty. This means that we will come and perform a warranty repair for any defect or issue that is covered by the warranty at no charge. The warranty gives you the peace of mind that you are receiving a high quality product that’s designed to last for the long-term. At Midwest Electric & Generator, Inc., we are committed to ensuring that your generator is in good working order for as long as possible. To do this, regular maintenance is highly recommended. We can maintain your system so that issues can be caught before they start, saving you a great deal of money as you preserve the integrity of your system. To learn more about our generators and our other electrical services or request a free quote, call 612-284-1550 today.